One side is a spanner wrench and other side is a hex nut wrench. A very handy item for any kegerator owner to have whether you're tightening your beer faucet or keg coupler. This heavy duty draft beer faucet wrench and hex nut wrench is the versatile tool you need to install and maintain proper flow throughout your system. One side is a spanner wrench that helps tighten draft beer faucets to beer shanks or beer tap towers. The other side is a hex nut wrench which tightens the nut on your keg coupler. Proper tightening throughout your system will prevent leaks and your beer pouring properly. Made in USA of steel with a rubber grip handle, you can be confident that this essential tool will prove sturdy and easy-to-use for draft beer maintenance, repairs, and installations whenever you need it. A sturdy wrench with a good feel in hand. The spanner pin is shaped in a slightly triangular form that makes the tool want to climb out of the drive hole. A little work with a file makes it work much better. Hard to mess up, it's a wrench. Stout little tool, made very well. No problem tightening or loosing beer lines, Co2 lines or the facets. Glad to hear this tool served you well! 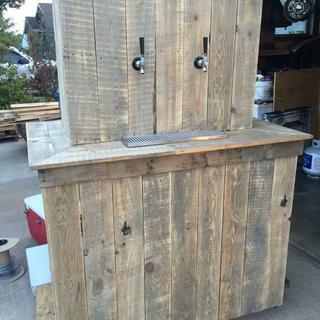 Thank you for sharing the photos of the bar you built. It looks amazing! The faucet wrench is well constructed and works perfectly for tightening the faucet onto the shaft. I assumed the open end would fit the nut on the 7/8 inch shaft on the inside of the kegorator but it is too small. Product is sturdy and will never need to be replaced! It does the job--just-- but an extra 1/16" of an inch in length to the prong on the faucet wrench would help immensely. The wrench I had had trouble finding the hole for the faucet, and frequently came loose when applying pressure to turn the faucet. Thank you for taking the time to leave a review. I will be happy to pass your feedback on to our product team. Those small adjustments can make a difference. Thank you for shopping at Kegworks! Sorry but not good news on this wrench. About 5th time I used it, I broke the tip off it!! Thank you for your feedback. This is the first we've heard of this wrench breaking, especially after only 5 uses. A customer care representative will reach out to you directly to arrange for a replacement or refund. We appreciate your business and hope you shop with us again. Cheers! I need it to remove the tap so I can replace the beer line. Thought it would be nice to have a single tool for when I disconnect everything and clean the lines. I need a wrench. And I selected that one. It is a nice tool to have especially to tighten the shank nut inside the draft tower. I wanted to change my beer line and didn't have a tool to loosen the nut located in the Beer faucet tower. Hoping this tool will help with being able to remove that nut so that i can replace the lines. Heavy duty, two tools in one. One tool covers two issues. The illustration appears to be of a heavy duty type spanned wrench which I needed. So I do not have to go out to my shop every time to get a wrench. The price was good, and the flexibility for both faucet and shank maintenance is handy. 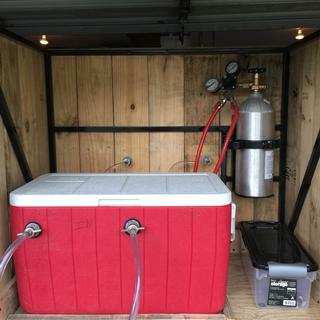 I have a kegerator and was given a keg cleaning kit from your company for Xmas. The tool that came with the kit was inadequate to completely take the lines and tap apart and my brother told me to buy this wrench. He has one.